We are the premier concrete coatings company in the Raleigh-Durham Chapel Hill area of North Carolina with over 30 years in the coatings industry. We offer many color options for your concrete and garage floors to provide one-of-a-kind designs that can look as unique as granite or even have a 3-dimensional appearance. 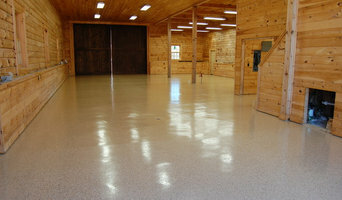 We offer all types of epoxy floors, staining, stamping and overlays. From garage floors that last a lifetime to patio's that look like hardwood. We do non skid pool decks and basement floors that will amaze everyone. Check out our Blog for some of our recent projects. Serving both residential and commercial customers, we’ll work with you to stay within budget and we strive for nothing less than 100% customer satisfaction! Robert brings a vast amount of chemical application knowledge to every project. He knows what chemical materials to use at certain times of the year, and how weather conditions affect the performance of each product. Without this knowledge, an improper commercial or garage floor application simply won’t last; it will not bond properly and you will get hot tire pickup within a very short amount of time. Robert is trained and certified by 6 different manufactures. Robert knows the proper materials to use to achieve a very tough and beautiful finish for your concrete floor. Most house painters do not possess the chemical knowledge needed to guarantee a concrete floor won’t peel. At Robert Witcraft Decorative Concrete Coatings, we do. We offer a LIFETIME GUARANTEE on our floors. Remodeling a kitchen? Updating your bathroom? 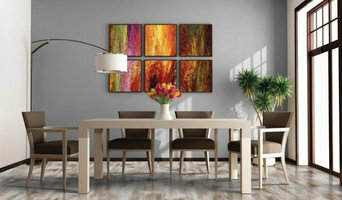 Upgrading your dining room to hardwoods? Replacing your family room carpet? 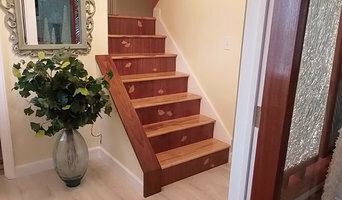 Cape Fear Flooring and Restoration has the home improvement solutions for all your needs. While many flooring stores in the Fayetteville area are part of large national chains, we are a locally-owned, veteran-owned company - with the flexibility to make quick decisions and a staff of professionals who you know and work with consistently. During any real estate transaction, the best way to ensure you know all the strengths and weaknesses of the property is to have an Infinite Home Inspection. Choose a Certified Home Inspector who has been working in this industry his entire life and provides you a one-stop shop for all your home inspection and testing needs. Infinite Home Inspections is owned and operated by Paul DeFalco, a Certified Home Inspector through the American Home Inspector Training Institute (AHIT). Paul and his team are proud to provide quality home inspections and related services to Wake County, Johnston County and the Greater Triangle area. We are based in Clayton and conduct inspections throughout Raleigh, Durham, Chapel Hill and surrounding areas. At Infinite Home Inspections, we believe the more you know about a property, the more prepared you will be. All homes have strengths and weaknesses. Infinite Home Inspections is experienced in identifying each and will happily help you understand the issues that must be addressed immediately and the ones that can wait. Simply Kept provides professional organizing services that make space more simple, aesthetic, and livable. We focus on commercial and residential masonry including; footings, crawlspaces, monolithic slabs, veneers, outdoor kitchens, fireplaces, drive ways and much more! Since 1990, Mante Masonry has employed the best foremen and crew members to meet your masonry needs. Our experienced team is uniquely qualified to handle all sizes and types of masonry projects, from small crawl spaces and fire pits to large scale veneers and retaining walls. We employ only the best bricklayers in the region to provide our customers with the highest quality and craftsmanship on their projects. Our level of service is unmatched. We are fully insured professional masonry company based in Durham, NC. We have close to 30 years of experience in brick, block, stone and concrete services. Our high quality job performance has earned Mante Masonry a reputation as one of the best contractors in RDU and surrounding areas. Our high quality of work sells itself and our mason crews are continuously trained and supervised. The services we provide include, but are not limited to: brick and block foundation systems, poured stem wall slab and monolithic slab foundation systems, brick or stone veneers and steps, concrete flat work and concrete pavers, fireplaces, patios, outdoor kitchen and pool area hardscapes, flagstone and much more. Our company is based on the belief that our customers' needs are of the utmost importance. Our entire team is committed to meeting those needs. As a result, a high percentage of our business is from repeat customers and referrals. Distinctive Wallcoverings is a trade company of Richard Tuttle and Associates and is a proud member of the Wallcovers Installers Association(WIA) & hold a A+ rating with BBB. Our Service areas include all of the Raleigh, Durham and Chapel Hill areas. We also travel for regional commercial projects. We welcome the opportunity to earn your trust and deliver best service in the industry. Southeast Foundation & Crawl Space Repair specializes in fixing below-grade spaces. More specifically, we serve North Carolina residents with expert basement waterproofing, basement finishing, crawl space repair, foundation repair, concrete leveling and attic insulation. By being a specialist rather than a general contractor, we can ensure our technicians are experts when it comes to basements and foundations. Any of our techs who enter your home is trained, certified and experienced. Why do North Carolina homeowners choose Southeast Foundation & Crawl Space Repair? We offer permanent, affordable solutions with professional customer service. It doesn’t matter if your basement is flooding, if the walls are bowing or if your crawl space smells like mold. We use patented products that are installed by certified basement and foundation technicians. The solutions we provide come with written, transferrable warranties. Our work is fairly priced and both you and your home are treated with respect. If you are a homeowner in North Carolina dealing with below-grade issues, we are ready to help. We can waterproof your basement or restore your foundation. We can encapsulate your crawl space. We can level sunken concrete slabs or provide you a completely finished basement. Homeowners in southeastern North Carolina choose us with good reason. We service all southeastern North Carolina including Greater Wilmington and Fayetteville. FREE estimates contact us today! Central Vacuum Experts brings over 23 years experience to the Raleigh, Durham, Chapel Hill region of North Carolina installing central vacuums in new construction and existing homes as well as commercial offices, retail businesses, salons, veterinary clinics and medical clinics. We provide a lifetime warranty on our installations, and we service all central vac brands. Whether you’re looking for a team of Forest Hills, NC professionals or a handyman for a small renovation, you’ll find dozens of professional profiles and contact information for specialty contractors here on Houzz. Here are some related professionals and vendors to complement the work of specialty contractors: General Contractors, Landscape Contractors, Architects & Building Designers, Interior Designers & Decorators, Kitchen & Bath Designers. Let’s say you want to install custom wood flooring in your dining room, and you’ve found a Forest Hills, NC company with excellent reviews. Next you’ll want to contact the company and make some inquiries. Find specialty contractors on Houzz. Look in the Professionals section of our website under Forest Hills, NC specialty contractors, then select the nearest metro area for a contractor. You can also look through North Carolina photos of completed projects to see how a contractor might approach design challenges.